By the mid-1990s, the San Patricio Municipal Water District needed additional drinking water capacity to meet demand from municipal customers. At the same time a new industrial customer needed high quality process water and agreed to pay up front the cost of all facilities required to deliver the water. The challenge was meeting the industrial customer’s quality requirements given the variable quality of raw water from the Nueces River and in 1999 from Lake Texana. The answer turned out to be advanced membrane microfiltration. With guidance from the engineering firm Malcolm Pirnie, the District investigated the use of a treatment process including microfiltration, a technology which was not in wide use in municipal drinking water treatment plants because of cost. Selecting microfiltration meant the District could meet the quality requirements of the industrial customer and provide superior quality drinking water for municipal customers. 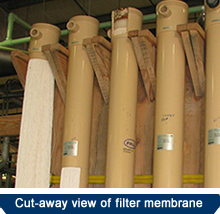 Using the microfiltration process for drinking water provides enhanced physical removal of possible microbiological contaminants and reduction in undesirable disinfection byproduct components. On-site pilot testing was performed on three separate microfiltration processes and the final selection was based on evaluation of competitive proposals. The next step was to build Plant C and install the hollow fiber membrane microfiltration equipment. It was put in service in January 2000 with an initial capacity of 7.8 million gallons per day. In 2006 it was expanded by 3.5 million gallons per day with half that new capacity going to DuPont’s fluoroproducts manufacturing plant and Air Liquide’s gas production facility. This allowed DuPont to discontinue operation of its own water treatment facilities which had been serving both operations. The District has been providing the DuPont industrial complex with water under contract since the company opened its Ingleside chemical plant in 1972. Units were modified and racks extended to increase capacity as plant operations were fine tuned over the years. In 2011 two additional racks were added with 2.0 million gallons per day capacity each. 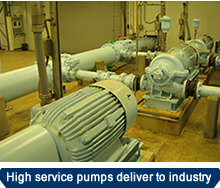 That brought the operating capacity to 16 million gallons per day. The District will also be working to have the capacity of Plant C re-rated. It is expected to have a working capacity of 21 mgd in the future when additional flocculation/sedimentation basins are added. The expansion potential of Plant C can be seen in this Plan View (click on Icon). Plant C now produces made-to-order industrial water for Ingleside Cogeneration, DuPont and Air Liquide, all located within sight of the Water District treatment complex. These companies each paid for their share of the plant and pay their share of operation and maintenance costs. To deal with raw water that is highly variable and silt-laden turbidity, Plant C has a traditional train of chemical pretreatment, coagulation, flocculation and sedimentation facilities to prepare water for microfiltration. 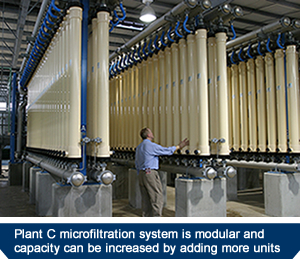 Plant C was designed so that it can be incrementally expanded up to a maximum of more than 40 million gallons per day by adding filtration modules and other equipment. 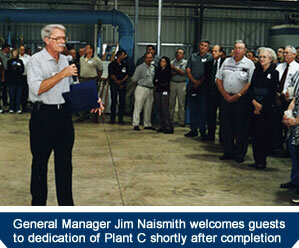 Work completed in 2011 makes the Plant C capacity twice that of Plant A which was built in 1968 and expanded 1972. Drinking water from the two plants is blended in the District’s clear wells and onsite storage before being distributed to customers.